The family of a Redwood City man, who died after multiple shocks from sheriff deputies' Tasers earlier this month, is calling on San Mateo County prosecutors to turn over any video footage of the deadly encounter. 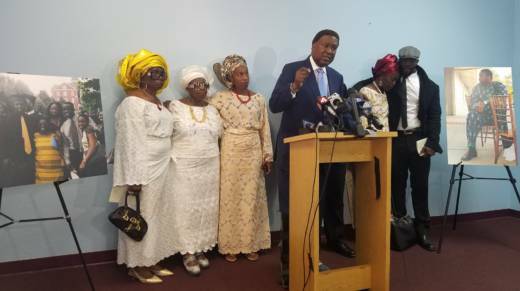 "What was taken from us is irretrievable," Chinedu Valentine Okobi's sister Ebele Okobi told reporters after a funeral service in San Francisco on Tuesday. "We will never get him back. We are just begging for the opportunity to be able to not have him murdered again by not knowing what happened to our brother," she said. The case has received international attention, driven in part by Ebele Okobi's career as a high-level Facebook executive. Deputies approached 36-year-old Chinedu Okobi at about 1 p.m. on Oct. 3, according to the San Mateo County Sheriff's Office. He was on foot and moving in and out of traffic. San Mateo County District Attorney Steve Wagstaffe has said Okobi was unarmed at the time of the incident. In dispatch audio of communication by the sheriff's department, archived by Broadcastify.com, a voice appearing to belong to a male deputy can be heard reporting a black man, 6 feet tall and about 220 pounds “running in traffic” on El Camino Real in Millbrae, near the intersection of Santa Helena Avenue. The deputy reported a Taser deployment about a minute later, then said as someone yells in the background: "Still resisting, third Taser deployment." Another voice arriving on scene a few minutes later requested more units. "We have a crime scene," he said. "Looks like they had pepper-sprayed the subject as well as multiple Taser deployments." Okobi was taken to the hospital and pronounced dead, according to an Oct. 3 Sheriff's Office press release. A deputy was treated for a cut and released from the hospital, and multiple deputies were treated for exposure to pepper spray, Wagstaffe said. Video taken by two bystanders and provided to the family's attorney, John Burris, shows multiple deputies wrestling with Okobi, Burris said Tuesday. His office has not made those videos public. "I see on the video where they take his body and they toss it around like he’s a rag muffin, and he falls down — they’re on top of him," Burris said. "And he gets up and he begins to run." Okobi was then taken to the ground by five deputies, Burris said, and he lost consciousness. But the bystander videos don't capture the whole encounter, he said. Burris is calling for the release of police dashboard camera video and any other videos collected in the case. The District Attorney's Office is leading an investigation into Okoboi's death. Wagstaffe said Tuesday that he intends to release videos in the case within 45 days of the incident. That timing pre-emptively follows a new state law that sets the deadline but doesn't take effect until July. Wagstaffe said all of the witnesses in the case should be interviewed before they have a chance to watch the footage. He said prosecutors plan to release that evidence ahead of a criminal charging decision in the case, which Wagstaffe expected in about two months. Two deputies used a Taser during the incident, for a total of three to four times, according to Wagstaffe. He said he also plans to release data recorded by the Tasers, including the number of deployments and shocks. The Sheriff's Office has identified five employees involved in the arrest: deputies John DeMartini, Alyssa Lorenzatti, Joshua Wang and Bryan Watt and Sgt. David Weidner. All had been interviewed and were on administrative leave as of last week, Wagstaffe said. The Sheriff's Office cited an ongoing investigation and did not answer specific questions about the case or the deputies involved. More than 200 people gathered for a memorial service Tuesday for Chinedu Okobi at the Ministerios Cosecha church in San Francisco. Family members remembered Okobi as a jovial, quick-witted man committed to his family. They said he paid child support for his 12-year-old daughter from an unemployment check the day before he died and expressed disbelief at the circumstances of his death. His sister, Ebele Okobi, remembered Okobi, the youngest of five siblings, as a dignified toddler with chubby cheeks. "He was also one of those serious-faced babies who look like tiny judges," Ebele Okobi said during the memorial service. "I still remember him pulling himself up to his full 2.5 feet to say ‘stop yaffing at me’ when he said something we found hilarious." Chinedu Okobi graduated with a degree in business administration from Atlanta's Morehouse College. He began to experience mental illness in 2009, his family said, but he held a series of jobs including working as a truck driver for Home Depot until January. Family members said a psychiatric emergency may have caused him to walk into traffic on Oct. 3. "Maybe there’s another approach here," Burris said. "Maybe it’s called de-escalation. Maybe it’s talking to that person in a reasonable manner."